Founded in 1978, Salesian Elementary and Junior High has nurtured the hearts and minds of thousands of children. The Salesian Sisters provide an educational environment rooted in the Preventive System of St. John Bosco. The Preventive System of Education, according to the heart of St. John Bosco, is comprised of Reason, Religion and Loving Kindness. This system facilitates the development of the young toward becoming good Christians and honest citizens. We educate with the purpose of impacting the young person holistically, believing that the young learn best through four interconnected experiences which we provide: home, school, church and playground. Together, Salesian Sisters, faculty and staff, parents and friends make Salesian an educational environment where life can grow and one can experience an atmosphere of hope. The school’s core curriculum includes language arts (reading, literature, grammar, verbal and written communication, study skills, penmanship, and spelling), mathematics, social studies, science, basic foreign language, and religion (catechesis, family life, liturgy, prayer and Christian service). Non-academic subjects include music, art, computer and physical education. Following the model of St. John Bosco and St. Mary Mazzarello, instruction in the Catholic faith is integrated into all aspects of home, school, church and playground using Gospel values and Catholic traditions with a strong emphasis on the Marian dimension. 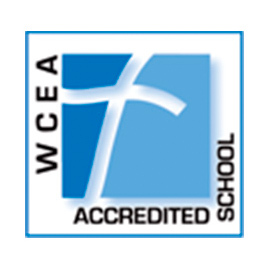 Using this philosophy, the faculty and staff are committed to educating their students in meaningful understanding of the Roman Catholic catechism. This is not limited to classroom instruction, but includes practice of traditions and rituals and facilitating opportunities to serve each other and the surrounding community. From their very first days at Salesian children are taught the value of loving kindness, honest friendship, and compassionate conflict resolution. The older students look out for the young students who in turn look up to them. Our beloved Buddy Program between the TK/Kinders and the 7th Graders is an adorable example of this in action. Central to the growth that our students experience in character and faith are Works of Service: Womens' Shelter donation drives, collection competitions for Get on the Bus, and serving weekly meals at the Salvation Army are just a few examples of the contributions made from these young hearts to the community around them. Salesian students grow each year in the awareness of how crucial it is to preserve our natural resources and in the knowledge of how they can contribute to conservation efforts. Our 55 acre campus as well as our proximity to the Redwood-covered mountains and the rugged California Coast, combined with the guidance of our passionate facility provides endless opportunities for the students to get their hands dirty and their budding conservationist hearts inspired. Coastal cleanups, sand dune stabilization, native tree reforestation, extensive recycling and composting (to feed the school's chickens), student-led water saving campaigns, low-emissions carpool policy, Zero Waste Week, Yosemite Science Camp, and Root Beer Float rewards for students who bring in reusable cups are just some examples of what our students experience on their journey to understand and preserve God's green Earth! Salesian is an official Ocean Guardians Project School. Click here to learn more about the Ocean Guardian program.